Characters: Mr. Rosenthal, Mr. Wilcox, Mrs. Wilcox, R.A.
Way back in … 2002…? Anyway, I used to be part of Keenspot, and Keenspot used to do comic books. Roomies! comic books collected both the original strips and also featured newer stories I wrote which fit into the continuity. This is page one of the first of them, and it takes place during college orientation. Martinsville, a city not far from Indiana University’s Bloomington, Indiana, is alleged to have been a “KKK stronghold” in the 1920s. In 1968 there was a high-profile murder of a black encyclopedia saleswoman that brought the city into attention again, and it became part of the national conversation on racially-motivated crimes. During the time I was in college, some of my peers said it was where the KKK in fact originated, which is an accusation which obviously can’t withstand scrutiny, but such accusations — reality, hyperbole, or otherwise — had very heavily colored my feelings on the city. Apparently it’s a better place now! Maybe! (According to the white people who live there, anyway.) Nonetheless, it is Martinsville’s less-than-stellar historical reputation that inspired the signs in the first panel, deserved or not. If you live in Martinsville and are not a white supremacist, I apologize for my blanket libel. The other three panels introduce the super-exciting characters of the Residence Assistant and a gaggle of parents. Be still, hearts. I sense the makings of Dumbverse Ruth. Hooray! Content I’ve never read! Is that gun an AKKK-47? Good eye. Few would properly identify a rifle made by the great Michael Klansnikov. Nice to kick it off with some things most of us have probably never seen. Also, I wonder which one could be Joe’s dad. It’d never be the one with the beard, right? Shocking. Simply no family resemblance at all. Nope. And this site goes up less than a month after I archive binged on the original roomies site… Oh well. Now I know where to start my friends! Time to establish dominance over the comments section before Plasma Mongoose gets here! Bit late for that, I’m afraid. Not only beat you to it, but has since gone through seventeen avatars. This makes me very happy. Wonder when Willis is gonna put It’s Walky up for free. A decade or two? *Facepalm* I should read more… Although it’ll probably take as long to get to the alien parts. It’s Walky is already up free. Joyce and Walky isn’t. It will teach your kids survival in a hostile environment. Ie. College in a nutshell. And then of course I discover I have nothing to say about this. I enjoy the comments sections to see what ridiculous arguments brake out. Give it time, and those will surely break out. IT’S BREAK NOT BRAKE. CHEEZUS, can’t one even comment on a WEBCOMIC without seeing stupid SPELLING ERRORS. One PARTICULY carnt coment on a webcomik wivvout seeing stuped speling errers…. lerning to ignaw them is vital for yore blud presure. Mawwage. Mawwage is what bwings us togethuh today. That dweam – wivin a dweam! Now, did any of the Keenspot dead tree editions sell well enough to live past Diamond’s three-issue grace period? I had to buy the Roomies! Volume 1 book to read this. What a sucker I was!!!!!!!! It also makes you remarkably old. Nah, there was a reprint. Oh! I thought you were referring to the Keenspot comic! Yeah, I have Stop Worrying and Love the Beer too. Most of the commentary will be about the comics themselves, but I may talk about the context within the greater canon in some cases. The comments, on the other hand, I’d probably avoid like the plague. 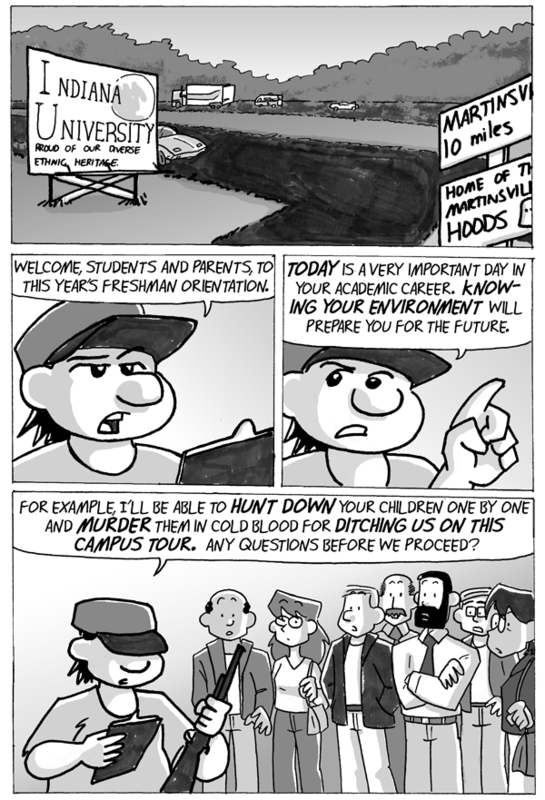 …This comic is about college. You’re welcome for ruining it all for you. For a while. Then it’s about something very, very different. So I guess the actual first Roomies! strip isn’t gonna be for a while later. It’s weird not having it on September 10. Some familiar looking vehicles in the background there. I wish I could say I just noticed that but I saw it when going through Roomies! book 1 to figure out when we’d get out of Book one. Hey, Willis, the “random” button isn’t working. I keep getting the same comic every time I press it! Although I’ve read the Roomie! archives thoroughly, I am very glad you’re doing this. (Especially with this previously non-internet content included). Irregular Webcomic started reposted the whole series from the beginning with new commentary, and it’s a treat to read all over again, and I believe the Walkyverse experience will be even better. Thanks, man. Yay! Now I can reread this with some of the content I’ve not seen in a proper chronolinear orderand without feeling the need to archive binge as I do. Should we expect to eventually get everything in the continuity freely available here, or will the paying subscriber only content stay pay only? David says he doesn’t know yet. I’ve been intending to get the pay sub for them eventually, but would honestly rather drop that kind of cash for a poster of figure than website access. All I know is that when my high-school orchestra or other teams I was on would take trips to Indianapolis, we commonly stopped in Martinsville to eat, and my black classmates would be *very* nervous. That sounds awful, I am sorry that you and your classmates had to go through that. My family is from elsewhere—but I was born in Martinsville, have lived there my whole life, and have always been saddened by my town’s reputation. I first learned about it on a field trip to Indianapolis when I was in the first grade– when a group of people saw the name of our town on the side of the bus, they started shouting swears, flipping us off, even throwing things at us. The next day, our teacher had to explain to us why those people were so angry with us; I remember being horrified and deeply ashamed, as though, as a small child, I was personally to blame. Indeed, I would like to personally apologize to anyone who has had to endure racist comments, remarks—or even simply experienced fear—in relation to my hometown. I would also like to say that, in my experience, the people of Martinsville today are terribly misrepresented by the town’s reputation. I won’t pretend to speak for everyone, but the vast majority of the people I have met and grown up with there have been unbigoted and respectful. The shame I felt as a child has followed my throughout my life, and deeply impacts the person that I am today. As a student at IU, it is not uncommon for my teachers to make derogatory statements or jokes about Martinsville. I used to be as vague as possible when my classmates asked where I am from—I learned that I could safely admit that I was from “Indiana,” “nearby,” or “around here” and avoid the unpleasant look that crosses a person’s eyes when you say, “I am from Martinsville.” These days, I no longer avoid it. How else can I hope for that reputation to change? Bigotry is a truly terrible thing. No person should be made to feel ‘less’ on account of their race, gender, orientation, disability—in short, any aspect of their being that is inherit to who they are. I would strongly hope that anyone reading this can appreciate that, would not judge a group of people based on reputation alone, and would not think badly of an individual, solely based on where they are from. Out of curiousity, what does “Best Reading Order” mean? Does it mean the best order to read each of the different series in, or will two of them start alternating updates (i dunno, if they ever happen concurrently)? But it basically means chronological order, right? It basically means things will be presented in the order the events occur, and not the order they’re written. For example, this comic was published in late 2001, but takes place before the proper start of Roomies!, which began in 1997. Well, yeah, otherwise we’d be starting with Ruth’s origin story, which is yet another fun one. We’d probably be starting with the flashback with Big Boss’s dad if we’re really going chronologically. Okay, that makes sense. Thanks for the clarification! Having lived in Greenwood, IN in the 80’s & 90’s, I got the dark humor in your contrast between the IU “diverse” sign and the Martinsville “Hoods”. I wonder how many others besides Whittier did…. Ruth’s not showing up for another ten months or so.